Another returning hero is confirmed for Avengers: Infinity War. Whoopi Goldberg wants in on Doctor Who. Supergirl is planning a Valentine’s Day-themed episode for Maggie and Alex. Mark Hamill reacts to Episode VIII’s title reveal. Plus, Librarians gets a fourth season, and an absolute ton of new Riverdale interviews. To me, my Spoilers! Another day, another confirmation of a character being in the film—this time actor Sean Gunn’s presence on set confirming that, the character he does the motion-capture for, Rocket Raccoon, will be joining the rest of his fellow Guardians in the movie. Zack Snyder makes the utterly shocking claim that Superman will have a major role in the movie, in terms of him both being there... and not being there, presumably referring to the period of the film set before the eventual moment the Man of Steel gets resurrected. James Wan has shared a new picture from the table read for the film’s script. Katherine Waterston discusses her first encounter with the Aliens in a new video interview. Mark Hamill reacts to the title for the movie going public, mid-interview with the AP. 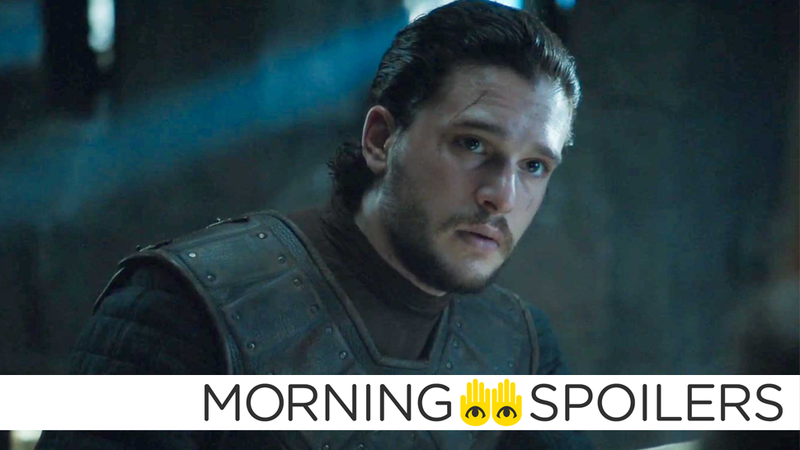 Watchers on the Wall reports that Kit Harington has been sighted for new filming currently taking place in Reynisfjara, Iceland. But interestingly, speculates that the scene may be a continuation of Jon’s departure from the shores of Dragonstone with Davos, Gendry, and Jorah, which was seen being filmed back in October last year, as the Iceland shoot involved several boats making their way to shore (which, combined with Harington’s presence, seems to tie the two events together). Watchers further speculates that the scenes are set up for Jon and his tag-team landing at the Nights Watch’s stronghold Eastwatch-by-Sea, ahead of a rumored quest for the team to venture beyond the Wall—presumably without backing from the Watch, considering Jon is no longer part of it—to face the White Walkers. This is all rumor and speculation for now, so take it with a pinch of salt, but it seems like this is the next big step for Jon after meeting up with Daenerys. Whoopi Goldberg would like a role. Wouldn’t it be incredible if Peter Capaldi regenerated into Whoopi Goldberg? You have a different quality now on television. The way you guys [Brits] have always done shows has always been the smartest and we’ve finally just figured it out. I like the idea of doing things the way y’all do them. You do some really fun stuff like Black Mirror or, you know, I’m still dying to do Doctor Who. MCUExchange reports that that Noah Gray-Cabey and Debby Ryan have been cast as the titular heroes Cloak and Dagger, respectively. While their initial report is based on unnamed sources, they back it up with evidence in the form of the fact both actors have started following showrunner Joe Pokaski on Twitter—and Ryan in particular has become a follower of the show’s official account. With a new product idea greenlit, Emily (Vanessa Hudgens) tries to get her team inspired but can’t seem to break through their obsession with Fantasy Super Hero League. Meanwhile, Van (Alan Tudyk) is on a mission to be included in the Wayne Dream Team photo. Danny Pudi, Christina Kirk and Ron Funches also star. Jennie Pierson recurs. Executive producer Sera Gamble promises one major death in the upcoming season—and two major musical numbers, to lighten the mood. We have one or two massive musical numbers over the course of the season, largely because [executive producer] John McNamara’s writing the show, and that’s kind of his thing. I can say that major characters will die this season, Gamble reveals. So we have fun, but it’s also very serious at times. The upcoming Valentine’s Day episode will be, naturally, heavily focused on Alex and Maggie’s burgeoning relationship. EW reports that the episode will see the couple argue over the value of Valentine’s as a holiday, leading to Maggie reconciling with Alex over a romantic evening. Ahead of the show’s premiere tomorrow, the CW has released more interviews with the cast than you can shake the dead body of Jason Blossom at. Finally, here’s a new featurette going behind the scenes on Netflix’s upcoming zombie comedy.